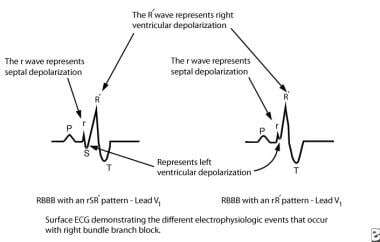 Right bundle branch block (RBBB) occurs when transmission of the electrical impulse is delayed or not conducted along the right bundle branch. Thus, the right ventricle depolarizes by means of cell-to-cell conduction that spreads from the interventricular septum and left ventricle to the right ventricle. This results in the characteristic electrocardiographic (ECG) pattern compared with a normal ECG as shown in the image below. These electrocardiographs demonstrate a normal sinus rhythm and a sinus rhythm with a right bundle branch block. Knowledge of the anatomy and electrophysiology of cardiac conduction system from the atrioventricular (AV) junction to the Purkinje fibers is essential to understanding the pathophysiology of right bundle branch block. Right bundle branch block occurs when the electrical impulse from the bundle of His does not conduct along the right bundle branch. Conduction down the left bundle branch proceeds normally, and the interventricular septum and left ventricle rapidly depolarize in the normal fashion. Depolarization of the right ventricle occurs later and is comparatively slow, accounting for the electrocardiographic (ECG) findings in right bundle branch block (see the images below). This image depicts the electrophysiologic events of right bundle branch block. AV = atrioventricular. Pathophysiology of right bundle branch block is described. AV = atrioventricular; LV = left ventricular; RV = right ventricular. The cardiac conduction system develops from rings of specialized tissue found in the embryonic heart tube. One theory describes four rings, each located between different segments of the heart tube. With looping and growth of the cardiac septi, the rings are brought together and develop into the sinus node, the AV node, and the penetrating bundle. Another theory describes a single ring of tissue located between the bulbus cordis and the primitive ventricle, which gives rise to the AV node, His bundle, right bundle branch, and left bundle branch. 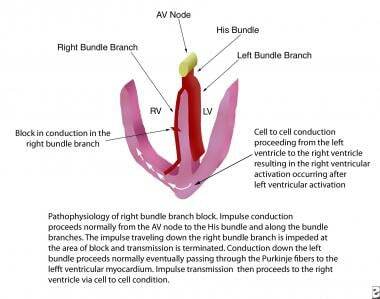 The AV junction can be divided into three regions as follows: transitional cell zone, AV node, and penetrating portion of the AV bundle (His bundle, common bundle). The transitional cell zone is where the right atrium merges with the compact AV node by means of discrete atrial pathways termed the slow and fast pathways. At the apex of the triangle of Koch, the compact AV node becomes the penetrating bundle of His. It penetrates the central fibrous body at the attachment of the tendon of Todaro, runs between the membranous septum and the muscular septum, and bifurcates at the crest of the muscular ventricular septum. The His bundle is divided into three anatomic segments. 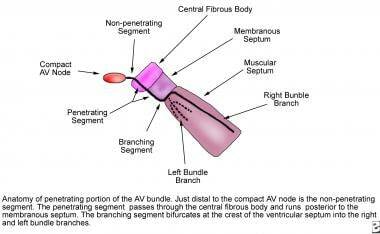 The proximal or nonpenetrating segment lies distal to the AV node and proximal to the central fibrous body. The middle or penetrating segment penetrates the central fibrous body and runs posterior to the membranous septum. The distal or branching segment bifurcates at the crest of the muscular septum into the right and left bundle branches (see the image below). Anatomy of the penetrating portion of the atrioventricular (AV) bundle is shown. The right bundle branch, a direct continuation of the penetrating bundle of His, originates distal to the attachment of the septal leaflet of the tricuspid valve with the membranous septum and surfaces on the right ventricular septum just below the papillary muscle of the conus. It is unbranched and proceeds toward the apex of the right ventricle along the posterior margin of the septal band, courses through the moderator band to the base of the anterior papillary muscle, and proceeds to the right ventricular free wall. The left bundle branch originates at the crest of the muscular ventricular septum just distal to the membranous septum. It arises in a fanlike fashion that descends inferiorly along the left ventricular septal surface beneath the noncoronary cusp of the aortic valve. The left bundle branch usually branches into three major fascicles. The anterior fascicle is directed to the base of the anterolateral papillary muscle, the posterior fascicle is directed to the base of the posteromedial papillary muscle, and, in 60% of hearts, a central fascicle proceeds to the midseptal region. When no central fascicle is present, as in 40% of hearts, the midseptal region is supplied by radiations from the anterior fascicle or the anterior and posterior fascicles. For a discussion on the anatomy of subtypes, see below. 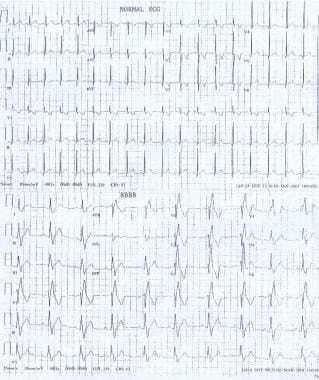 In normal cardiac conduction, electrical excitation of the heart proceeds in a sequential manner from the atria to the ventricles and is demonstrated on the surface ECG (see the image below). 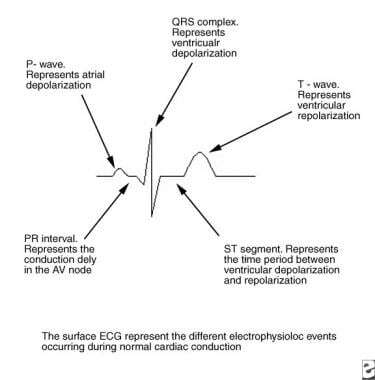 This image depicts the electrophysiologic sequence of events that occur in normal cardiac conduction. AV = atrioventricular. The electrical impulse is generated in the sinus node and proceeds along proposed internodal conduction pathways to reach the AV node. As the impulse conducts through the AV node, conduction slows, allowing time for atrial contraction to occur before the ventricle is activated (PR segment). After the impulse passes through the compact AV node, it is rapidly conducted through the crux of the heart to the ventricles by means of the bundle of His (penetrating bundle) to the branching bundle, the bundle branches, the distal Purkinje fibers, and finally the ventricular myocardial cells (narrow QRS complex). When depolarization is complete, the ventricle repolarizes in preparation for conducting another impulse. Three types of right bundle branch block have been identified in electrophysiologic studies. Proximal, or central, right bundle branch block occurs when a conduction block is present just distal to the bundle of His in the superior aspect of the right bundle branch. This generally occurs when the proximal bundle is injured during surgery for lesions with an inlet or membranous ventricular septal defect (VSD). Another type of right bundle branch block occurs when the impulse is interrupted between the proximal and distal aspects of the right bundle branch; this type is most commonly observed after surgical division of the moderator band during repair of tetralogy of Fallot. Distal right bundle branch block is observed when distal ramifications of the right bundle are disrupted during right ventriculotomy or resection of muscle bundles in the right ventricular outflow tract. Regardless of the type of right bundle branch block, the ECG patterns remain similar. In general, surgically induced right bundle branch block results in no clinically significant acute hemodynamic consequences and has a benign course over the long term. In rare cases, a progression to complete heart block and sudden death is a concern, particularly if the right bundle branch block pattern is accompanied by additional evidence of substantial injury to the His-Purkinje system (eg, left anterior hemiblock, first-degree AV block). Patients who have undergone repair for tetralogy of Fallot and who have an right bundle branch block pattern with a markedly prolonged QRS duration (>180 ms) may be at increased risk for significant ventricular arrhythmias and sudden death. Patients with right bundle branch block from other causes may have diverse natural histories depending on the underlying disease. The outcome may be benign in some forms of familial right bundle branch block, or sudden death may result if the right bundle branch block pattern on ECG is due to Brugada syndrome, arrhythmogenic right ventricular cardiomyopathy (ARVC), or Kearns-Sayre syndrome. In children, most cases of right bundle branch block occur after intracardiac surgery, such as congenital heart surgery associated with repair of a ventricular septal defect (VSD) and tetralogy of Fallot, as well as cardiac transplantation. Right bundle branch block has also been described in patients undergoing cardiac catheterization, particularly transcatheter closure of perimembranous VSDs and catheter ablation for ventricular tachycardia. Right bundle branch block has been associated with cardiomyopathy, myocarditis, congestive heart failure, right ventricular systolic dysfunction,  atrial septal defect (ASD), and Ebstein anomaly of the tricuspid valve. A transient form of right bundle branch may be observed in patients with premature atrial contractions (Ashman phenomenon) or supraventricular tachycardia (rate dependent right bundle branch block). This occurs when an early impulse is conducted from the atrioventricular (AV) node to the His bundle while the right bundle branch is still refractory but the left bundle is not. Conduction down the right bundle branch is therefore delayed or blocked, resulting in a transient right bundle branch block pattern on the electrocardiogram (ECG). Kearns-Sayre Syndrome is a mitochondrial myopathy with the physical findings of ptosis, chronic progressive external ophthalmoplegia, and abnormal retinal pigmentation. Patients are at risk for heart block and sudden death. Rarely, patients present with dilated cardiomyopathy and heart failure. Patients may have isolated right bundle branch block or right bundle branch block with a left anterior fascicular block. Right bundle branch block has been associated with blunt chest trauma and polymyositis. Right bundle branch block may disguise the characteristic QRS morphology associated with ventricular pre-excitation (see Supraventricular Tachycardia, Wolff-Parkinson-White Syndrome). In patients with known right bundle branch block (eg, tetralogy of Fallot) and Wolff-Parkinson-White syndrome with a left-sided accessory pathway, the presence of the pathway is often undetected. In patients with right bundle branch block and a right-sided accessory pathway, the QRS may appear relatively normal without the expected right bundle branch block pattern. The most common cause of right bundle branch block in children is surgery associated with repair of an isolated ventricular septal defect (VSD) or another congenital heart disease that includes a VSD (eg, double-chambered right ventricle, atrioventricular [AV] canal, or tetralogy of Fallot). The incidence of right bundle branch block ranges from 25%-81% after repair of a VSD alone to 60%-100% after repair of tetralogy of Fallot. The variation of right bundle branch block after surgery is likely due to the proximity of the VSD to the His bundle and right bundle, as well as the surgical technique. For example, right bundle branch block is less common with transatrial repair or exclusion ventriculotomy repair of a VSD than with other procedures. Surgical repair of tetralogy of Fallot, in addition to closing the VSD, is often associated with a transannular patch of the right ventricular outflow tract. This situation often results in clinically significant pulmonic valve insufficiency and progressive right ventricular dilatation as the patient ages. In addition, some patients have residual stenosis at various levels in the pulmonary outflow tract. By the time the patient is in his or her late teens or young adulthood, the right ventricle has been subjected to years of abnormal hemodynamics. As noted above, patients with right bundle branch block and a markedly prolonged QRS duration (>180 ms) may be at increased risk for ventricular tachycardia and sudden death. The prognosis for patients with isolated right bundle branch block is excellent because the course of right bundle branch block is generally benign. In other patients with right bundle branch block, such as those who have undergone heart transplantation or repair of congenital heart disease and those with Brugada syndrome, Kearns-Sayre syndrome, myocarditis, or cardiomyopathy, the prognosis depends on the underlying condition causing the right bundle branch block and the morphology of the systemic ventricle. In a more recent study, investigators found that acute right ventricular resynchronization led to short-term improvement of hemodynamics in children early after repair of tetralogy of Fallot, and the effect was maximized when paced from the site of the latest right ventricular activation. The researchers suggested right ventricular resynchronization has the potential to be a useful nonpharmacologic adjunct in the management of hemodynamically compromised children. Surgically induced right bundle branch block is generally considered to have in no clinically significant acute hemodynamic consequences and has a benign course over the long term. However, the role of right bundle branch block in acute right ventricular dysfunction following tetralogy of Fallot repair is unknown since this is a routine postoperative finding. Patients who have undergone tetralogy of Fallot repair and have a QRS duration more than 180 milliseconds may have a long-term risk of ventricular arrhythmias and sudden death. In rare cases, if right bundle branch block is associated with injury to the proximal His-Purkinje system (eg, left anterior hemiblock, first-degree atrioventricular [AV] block), it can progress to complete heart block and sudden death. Patients with familial right bundle branch block may have a benign course, whereas those with right bundle branch block in association with Brugada syndrome, arrhythmogenic right ventricular cardiomyopathy (ARVC), or Kearns-Sayre syndrome are at risk for sudden death. If right bundle branch block progresses to complete heart block, the patient may experience fatigue, exercise intolerance, dizziness, syncope, or sudden death. Some patients who have undergone tetralogy of Fallot repair and have a right bundle branch block pattern and a markedly prolonged QRS may be at increased risk for ventricular tachycardia or sudden death. Patients, parents, and primary medical providers should be informed that right bundle branch block per se does not typically predict specific future problems or management concerns. Patients with right bundle branch block are not specifically limited in their activities; however, associated conditions may influence activity restrictions. For patient education resources, see the Heart Health Center, as well as Tetralogy of Fallot. Stein R, Nguyen P, Abella J, Olson H, Myers J, Froelicher V. Prevalence and prognostic significance of exercise-induced right bundle branch block. Am J Cardiol. 2010 Mar 1. 105(5):677-80. [Medline]. Stephan E, Chedid R, Loiselet J, Bouvagnet P. Clinical and molecular genetics of familial bundle branch block related to chromosome 19 [in French]. Arch Mal Coeur Vaiss. 1998 Dec. 91(12):1465-74. [Medline]. Deschenes I, Baroudi G, Berthet M, et al. Electrophysiological characterization of SCN5A mutations causing long QT (E1784K) and Brugada (R1512W and R1432G) syndromes. Cardiovasc Res. 2000 Apr. 46(1):55-65. [Medline]. Keller DI, Barrane FZ, Gouas L, et al. A novel nonsense mutation in the SCN5A gene leads to Brugada syndrome and a silent gene mutation carrier state. Can J Cardiol. 2005 Sep. 21(11):925-31. [Medline]. Adams JC, Nelson MR, Chandrasekaran K, Jahangir A, Srivathsan K. Novel ECG criteria for right ventricular systolic dysfunction in patients with right bundle branch block. Int J Cardiol. 2013 Aug 20. 167(4):1385-9. [Medline]. [Full Text]. Meziab O, Abrams DJ, Alexander ME, et al. Utility of incomplete right bundle branch block as an isolated ECG finding in children undergoing initial cardiac evaluation. Congenit Heart Dis. 2018 May. 13(3):419-27. [Medline]. van Beynum I, Morava E, Taher M, et al. Cardiac arrest in Kearns-Sayre syndrome. JIMD Rep. 2012. 2:7-10. [Medline]. [Full Text]. Chevallier S, Forclaz A, Tenkorang J, et al. New electrocardiographic criteria for discriminating between Brugada types 2 and 3 patterns and incomplete right bundle branch block. J Am Coll Cardiol. 2011 Nov 22. 58(22):2290-8. [Medline]. Daga B, Minano A, de la Puerta I, et al. Electrocardiographic findings typical of Brugada syndrome unmasked by cocaine consumption [in Spanish]. Rev Esp Cardiol. 2005 Nov. 58(11):1355-7. [Medline]. Marcus FI, McKenna WJ, Sherrill D, et al. Diagnosis of arrhythmogenic right ventricular cardiomyopathy/dysplasia: proposed modification of the Task Force Criteria. Eur Heart J. 2010 Apr. 31(7):806-14. [Medline]. [Full Text]. Veeram Reddy SR, Du W, Zilberman MV. Left ventricular mechanical synchrony and global systolic function in pediatric patients late after ventricular septal defect patch closure: a three-dimensional echocardiographic study. Congenit Heart Dis. 2009 Nov-Dec. 4(6):454-8. [Medline]. Hui W, Slorach C, Dragulescu A, Mertens L, Bijnens B, Friedberg MK. Mechanisms of right ventricular electromechanical dyssynchrony and mechanical inefficiency in children after repair of tetralogy of Fallot. Circ Cardiovasc Imaging. 2014 Jul. 7(4):610-8. [Medline]. Vojtovic P, Kucera F, Kubus P, et al. Acute right ventricular resynchronization improves haemodynamics in children after surgical repair of tetralogy of Fallot. Europace. 2018 Feb 1. 20(2):323-8. [Medline]. [Guideline] Finnish Medical Society Duodecim. Myocardial infarction. In: EBM Guidelines. Evidence-Based Medicine [Internet]. Helsinki, Finland: Wiley Interscience. John Wiley & Sons; 2008 Apr 2. [Full Text]. Jain R, Dalal D, Daly A, et al. Electrocardiographic features of arrhythmogenic right ventricular dysplasia. Circulation. 2009 Aug 11. 120(6):477-87. [Medline]. [Full Text]. Becker AE, Anderson RH. Morphology of the human atrioventricular junctional area. Wellens JHH, Lie KI, Janse MJ, eds. In: The Conduction System of the Heart. Chicago: Lea & Febiger; 1976. 263-71. Brugada J, Brugada R, Brugada P. Right bundle-branch block and ST-segment elevation in leads V1 through V3: a marker for sudden death in patients without demonstrable structural heart disease. Circulation. 1998 Feb 10. 97(5):457-60. [Medline]. Brugada P, Brugada J. Right bundle branch block, persistent ST segment elevation and sudden cardiac death: a distinct clinical and electrocardiographic syndrome. A multicenter report. J Am Coll Cardiol. 1992 Nov 15. 20(6):1391-6. [Medline]. Brugada P, Brugada R, Brugada J. Sudden death in patients and relatives with the syndrome of right bundle branch block, ST segment elevation in the precordial leads V(1)to V(3)and sudden death. Eur Heart J. 2000 Feb. 21(4):321-6. [Medline]. Colvin EV. Cardiac embryology. Garson A, Bricker JT, Fisher DJ, Neish SR, eds. In: The Science and Practice of Pediatric Cardiology. 2nd ed. Baltimore, MD: Williams & Wilkins; 1998. 91-123. Esscher E, Hardell LI, Michaelsson M. Familial, isolated, complete right bundle-branch block. Br Heart J. 1975 Jul. 37(7):745-7. [Medline]. Ewing L. Bundle-branch and fasicular blocks. Gillette PC, Garson A, eds. In: Pediatric Arrhythmias: Electrophysiology and Pacing. Philadelphia: WB Saunders Co; 1990. 319-21. Garson A. Electrocardiography. Garson A, Bricker JT, Fisher DJ, Neish SR, eds. In: The Science and Practice of Pediatric Cardiology. 2nd ed. Philadelphia, PA: Lippincott, Williams & Wilkins; 1998. 736. Horowitz LN, Alexander JA, Edmunds LH Jr. Postoperative right bundle branch block: identification of three levels of block. Circulation. 1980 Aug. 62(2):319-28. [Medline]. Kehoe RF, Bauernfeind R, Tommaso C, et al. Cardiac conduction defects in polymyositis: electrophysiologic studies in four patients. Ann Intern Med. 1981 Jan. 94(1):41-3. [Medline]. Komajda M, Frank R, Vedel J, et al. Intracardiac conduction defects in dystrophia myotonica. Electrophysiological study of 12 cases. Br Heart J. 1980 Mar. 43(3):315-20. [Medline]. Krongrad E. Prognosis for patients with congenital heart disease and postoperative intraventricular conduction defects. Circulation. 1978 May. 57(5):867-70. [Medline]. Nery PB, Ha AC, Keren A, Birnie DH. Cardiac resynchronization therapy in patients with left ventricular systolic dysfunction and right bundle branch block: a systematic review. Heart Rhythm. 2011 Jul. 8(7):1083-7. [Medline]. Ogura Y, Kato J, Ogawa Y, et al. A case of alternating bundle branch block in combination with intra-Hisian block. Int Heart J. 2005 Jul. 46(4):737-44. [Medline]. Pickhoff AS. Electrophysiology; development and function of the cardiac conduction system. Allen HD, Gutgesell HP, Clark EB, Driscoll DJ, eds. In: Heart Disease in Infants, Children, and Adolescents: Including the Fetus and Young Adult. 6th ed. Philadelphia, PA: Lippincott Williams & Wilkins; 2000. 414-24. Priori SG, Napolitano C, Gasparini M, et al. Clinical and genetic heterogeneity of right bundle branch block and ST- segment elevation syndrome: A prospective evaluation of 52 families. Circulation. 2000 Nov 14. 102(20):2509-15. [Medline]. Sanyal SK, Johnson WW. Cardiac conduction abnormalities in children with Duchenne's progressive muscular dystrophy: electrocardiographic features and morphologic correlates. Circulation. 1982 Oct. 66(4):853-63. [Medline]. Scheinman MM, Goldschlager NF, Peters RW. Bundle branch block. Cardiovasc Clin. 1980. 11(1):57-80. [Medline]. Silka MJ. Bundle branch block. Garson A, Bricker JT, Fisher DJ, Neish SR, eds. In: The Science and Practice of Pediatric Cardiology. 2nd ed. Philadelphia, PA: Lippincott Williams & Wilkins; 1998. 2033-6. Simonsen EE, Madsen EG. Four cases of right-sided bundle-branch block and one case of atrioventricular block in three generations of a family. Br Heart J. 1970 Jul. 32(4):501-4. [Medline]. Stephan E. Hereditary bundle branch system defect. A new genetic entity?. Am Heart J. 1979 Jun. 97(6):708-18. [Medline]. Stephan E. Hereditary bundle branch system defect: survey of a family with four affected generations. Am Heart J. 1978 Jan. 95(1):89-95. [Medline]. Sung RJ, Tamer DM, Garcia OL, et al. Analysis of surgically-induced right bundle branch block pattern using intracardiac recording techniques. Circulation. 1976 Sep. 54(3):442-6. [Medline]. Udink ten Cate FE, van Heerde M, Rammeloo LA, Hruda J. Transientelectrocardiographic abnormalities following blunt chest trauma in a child. Eur J Pediatr. November 2008. 167(11):1331-3. Van Praagh R, Van Praagh S. Morphologic anatomy. Fyler DC, ed. In: Nadas' Pediatric Cardiology. Philadelphia, PA: Hanley & Belfus; 1992. 23. Waller BF, Schlant RC. Anatomy of the heart. O'Rourke RA, Schlant RC, Roberts R, et al, eds. Hurst's The Heart. 8th ed. New York, NY: McGraw-Hill Medical; 1994. 99-102. Yasui H, Yoshitoshi M, Komori M, et al. Cardiodynamic effects of experimental right bundle branch block in canine hearts with normal and hypertrophied right ventricles. Am Heart J. 1985 Jan. 109(1):69-77. [Medline]. Ksiazczyk TM, Tomik A, Godlewski K, Werner B. Transient complete right bundle branch block following right heart catheterization in children - a report of two cases. Postepy Kardiol Interwencyjnej. 2016. 12(4):372-6. [Medline]. Thornton MD. Lower-extremity weakness in a teenager due to thyrotoxic periodic paralysis. J Emerg Med. 2017 Apr. 52(4):e133-e137. [Medline]. Marterer R, Hongchun Z, Tschauner S, Koestenberger M, Sorantin E. Cardiac MRI assessment of right ventricular function: impact of right bundle branch block on the evaluation of cardiac performance parameters. Eur Radiol. 2015 Dec. 25(12):3528-35. [Medline]. Karadeniz C, Atalay S, Demir F, et al. Does surgically induced right bundle branch block really effect ventricular function in children after ventricular septal defect closure?. Pediatr Cardiol. 2015 Mar. 36(3):481-8. [Medline]. This image demonstrates a wide S wave. The authors and editors of Medscape Drugs & Diseases gratefully acknowledge the contributions of previous authors Christopher Mart, MD; Kerry Rosen, MD; and Christopher Zachary, MD, to the development and writing of this article.